This section introduces technology resulting from our research and development. We are also ready to offer other technologies according to customer needs. 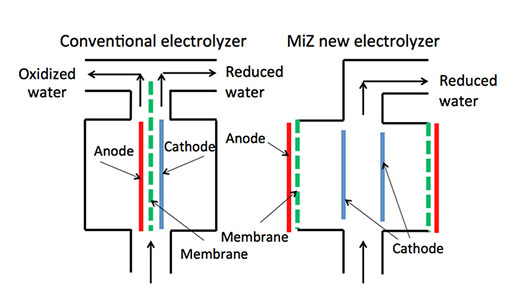 The new MiZ electrolyzer, like the conventional electrolyzer, is constituted by a cathode plate and an anode plate facing each other with a membrane therebetween, but the anode is set exposed to the outside of the electrolyzer, making contact with the membrane. When water is supplied into the electrolyzer, the space between facing surfaces of the membrane and the anode plate is filled with the water, forming a thin water film, but since the membrane itself absorbs and reserves water, just the anode function is exhibited without leakage of water to the outside. Since hydrogen can be produced continually in the cathode chamber, dissolved hydrogen water that is almost neutral can be produced. The MiZ electrolyzer does not produce acidic water in the anode chamber unlike the conventional alkali ion water producing devices, and thus there is no need to discard acidic water and discharge it as water, thereby saving natural resources. 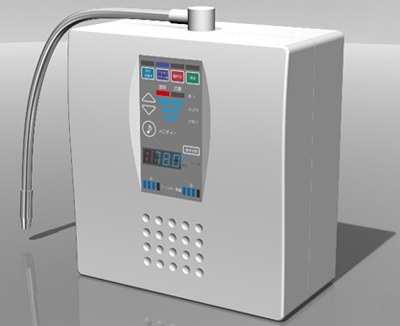 The non-destructive hydrogen adding apparatus is an apparatus for adding molecular hydrogen to commercial solutions for living bodies such as intravenous solution, dialysis fluid, liquid medicine, or organ storage solution from the outside of their containers. This has an advantage that molecular hydrogen can be added to a product without any modification of production process of the solutions for living bodies that require strict quality control. An exclusive apparatus (non-destructive hydrogen adding apparatus) constituted by an electrolyzer and a water tank is used in this apparatus. 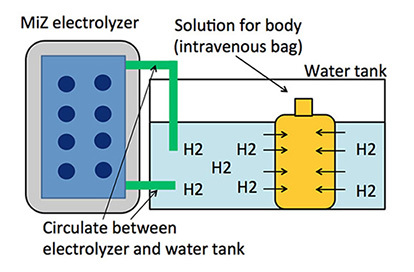 When a solution for living bodies (polyethylene bag) such as intravenous solution, dialysis fluid, or organ storage solution is immersed in hydrogen-containing water within the tank produced by the exclusive apparatus, the water in the water tank circulates between the electrolyzer and the water tank and is intermittently electrolyzed. Since the polyethylene bag is permeated with hydrogen, hydrogen can be dissolved under germfree conditions until reaching an equilibrium concentration by immersing the liquid medicine bag in saturated hydrogen water and leaving it therein. On the other hand, we are also developing simplified and disposable type of apparatus. This apparatus is a type with hydrogen generating agent and polyethylene bags in an aluminum bag. As in the case of non-destructive hydrogen adding apparatus as described above, when non-woven fabric containing the H2-generating agent was moistened with a small amount of water, and then both a polyethylene bag and the non-woven fabric were wrapped with aluminum foil under reduced pressure, hydrogen gas is permeated through the polyethylene bag and can be dissolved into the solution for living bodies (polyethylene bag) under germfree conditions. While solubility of molecular hydrogen into water under normal temperature and pressure is 1.6 ppm (1.6 mg/L), use of a super saturated hydrogen generating apparatus allows adding of approximately 5 - 10 ppm (5 - 10 mg/L) of molecular hydrogen into drinking water. The super saturated hydrogen generating apparatus is installed in a beverage container such as a plastic bottle, and water is added to a hydrogen generating agent in the generating apparatus. The inside of the plastic bottle is pressurized through the following reaction and hydrogen gas is generated. Shaking the beverage container then produces hydrogen water of a super saturated concentration (5 - 10 ppm). The hydrogen generating agent is constituted by components authorized as food additives. Moreover, the hydrogen generating agent does not come into direct contact with the water within the plastic bottle, and is thus safe. As the beverage is not selected as a rule, molecular hydrogen at a super saturated concentration can be added not only to water but to tea, sports drink and many other beverages. On the other hand, we have also developed the super saturated hydrogen generation apparatus of direct adding type in a beverage container. When the hydrogen generating agent enclosed by gas-permeable film is put into the beverage container such as a plastic bottle, the hydrogen gas is generated by the moisture of plastic bottle with similar chemical reactions as described above. The hydrogen gas is generated over time, and then the bottle is pressurized by hydrogen gas. Hydrogen water of a super saturated concentration (5 - 7 ppm) is produced by shaking the beverage container after hydrogen generating reaction. This machine generates 1－3 L/minute of high-concentration hydrogen water immediately. 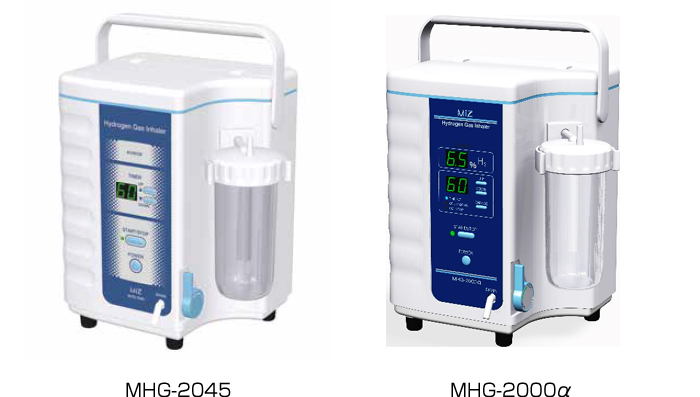 The saturated concentration of hydrogen is 1.6 ppm（1.6 mg/L） at normal temperature and normal pressure, however this machine generate 2.0－2.4 ppm（2.0－2.4 mg/L） hydrogen water by inside system. Also, it generates alkaline high-concentration hydrogen water. ・Acid water：This machine also generates acid water, but it is not for drinking (It is useful for face-wash etc.). It notifies by buzzer when it is acid water generation mode. ・Intensity of an electric current：This machine makes hydrogen water concentration rise by increasing an intensity of an electric current. Boost mode：When the current intensity is 4, this machine generates maximum concentration hydrogen water by turning boost mode to ‘ON’ because it makes current value maximize. Since the hydrogen gas supply apparatus generates hydrogen through electrolysis in principle, it has advantages of not needing a large mixed gas cylinder for diluting the hydrogen gas to a prescribed concentration ahead of time, keeping all processes from hydrogen generation at the cathode to a patient inhaling the gas to less than 10 % hydrogen gas concentration, which is an explosion limit, and supplying it safely. In addition, we prepare the hydrogen gas sensor which can measure 0-10 % of hydrogen gas concentration as needed. The hydrogen gas supply apparatus for living bodies is constituted by an electrolysis chamber into which the raw water to be electrolyzed is introduced, a membrane, and by electrode plates. 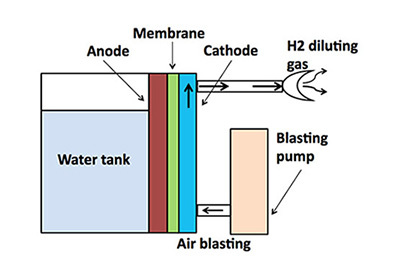 Hydrogen gas generates from the electrode plate that is a cathode, but since air or diluting gas is directly blown on to the cathode or cathode water surface, the hydrogen gas concentration near the cathode at the time of electrolysis can always be kept under the explosion limit. Hydrogen gas that is diluted by air or a diluting gas to be made into the target concentration can be supplied to patients. This apparatus can even be used as an independent apparatus or as an attachment integrated to an oxygen concentrator. A chemical reaction where when a methylene blue solution (blue color), to which is added a platinum colloid catalyst, is added to test water, the methylene blue solution turns colorless and transparent through the reductive reaction caused by the molecular hydrogen is utilized. 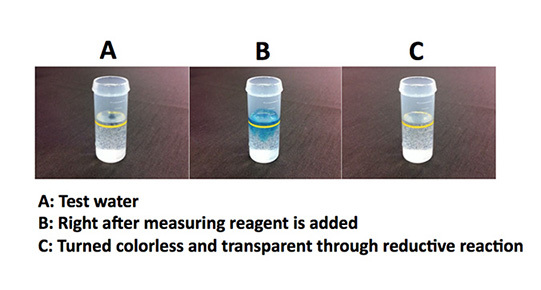 The dissolved hydrogen concentration within the test water can be easily determined from the dripped amount of the methylene blue solution containing the platinum colloid catalyst up to the end point of the color change. Details of this measuring method are disclosed in the following document.